Leah over at Just Me, Leah, posted this post – Pattern Mixing – a little while back. It inspired me somewhat, and I left a comment accordingly, because Autumn has just begun here and I’m on the lookout for that *one* great knit. Every year in autumn, I declare Knit Hunting season open. I only want one knit for each winter, and sometimes it takes me all of Autumn to find it. I thought perhaps Carter could model some of my past season knits and I could share the photos with you here on the blog. Carter is a little on the stick thin side whereas I most certainly am not.. I think the worst part of Carter is his bony shoulders. Sadly I do not have any 80’s shoulder pads handy in order to bulk them out a little. Also, it is super hard to put his arms into things. So we’ve gone for a cardigan draped over the shoulders look with these outfits. 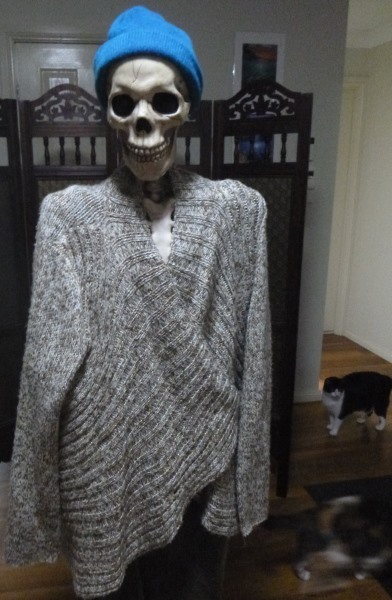 This particular knit was found one Autumn in Canberra, just when I had almost given up looking for that years knit. It has a gold thread that runs through it which is difficult to see in the photos. It has been one of my favourite knits of all time, even after it lost the buttons. It drapes and sits beautifully on me – and also on Carter, as you see in the above photo. “It drapes and sits beautifully”, yet I don’t like it. I’m not sure why, it’s a lovely colour. You could pad Carter’s shoulders with a rolled up pair of socks, flattened slightly. Thanks for the mention. I love the knit, and Carter! Oh the dress up opportunities throughout the year. He’d look spiffing on Halloween!